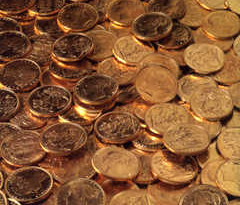 You are here: Home » Blog » Precious Metals » Gold » Should You Invest in Gold? Almost everyone will agree that making the right investments is one of the best ways to secure your financial future. Unfortunately, figuring out which investments are right for you is easier said than done and everyone knows only crazy people invest in gold, right? It’s easy to assume that just putting all your money in a bank account is the safest thing to do. But with today’s almost non-existent interest rates even low inflation could cause you to have a net loss in purchasing power over time. So obviously you need to find something that will provide a bit better return to counteract the effects of inflation. To do that, traditional wisdom tells you that you have to take on higher risk investments like stocks, bonds or real estate. However, in order to mitigate overall risk it is crucial that you diversify, and one option that otherwise savvy investors often overlook is investing in gold. There are many compelling reasons to invest in either physical gold or “paper gold” i.e. paper investments that hold physical gold or gold mining stocks. With one of the worst recessions in history right behind us, gold is particularly relevant to these uncertain times. Gold is “inversely related” to the price of many other assets, which means that Gold is a Crisis hedge so events that typically cause the value of stocks, bonds, and other paper investments to drop generally cause the value of gold to increase. Investors who invest exclusively in paper get the short end of the stick when crises strike, while “hard asset” gold investors tend to ride out such events more easily. That’s not the only reason to consider investing in gold, however. There is an old saying that, “Everything eventually returns to its intrinsic value”. The intrinsic value of paper assets like cash is virtually zero and all paper assets like stocks, bonds and mutual funds represent someone else’s liability so their value depends to some extent on their ability to “make good” on their promise. Although its market value may fluctuate, Gold never loses its intrinsic value. It will always be beautiful, ductile, malleable, divisible, and a good conductor of heat and electricity. In addition, it is very dense and it is unaffected by most acids. This makes it perfect for use as Jewelry, as an electronic component and for medicinal purposes. These uses give gold an intrinsic value in addition to its long history as an investment and store of value. While its price can be volatile in the short term, gold maintains its value well over the long term. And while most of our money supply is in the form of electronic notations on a spreadsheet somewhere, the average person only has a less than a hundred dollars in cold hard cash. Investing in Gold is the ultimate crisis insurance… if there were a nuclear war with a massive Electromagnetic Pulse (EMP) causing a massive electronic blackout and erasing all debits and credits, or less catastrophically if the stock market crashed (again), or the government decided to go on a massive money printing binge… the physical gold you have would still be valuable and in your possession. Should You Invest Exclusively in Gold? After considering all of the advantages, some have been tempted to do away with other investments in order to buy as much physical gold as possible. Under extreme circumstances such as war or hyperinflation, this may be logical, but generally it’s not advisable. One of the best rules of thumb regarding investing is to never put all of your eggs into one basket and this applies to gold as well. Many Financial Services ignore gold altogether, but will still tell you that diversification is essential. While investing in gold is a sound idea, under normal circumstances it should not comprise the entirety of your investment strategy. Conversely, even if you employ a highly skilled financial firm to manage your investments, relying solely on stocks and bonds is equally risky to your financial future. After all, as we saw in 2000 with Tech Stocks and in 2008 with real estate, derivatives and the overall market, one crisis could easily cause 50% -90% portfolio losses even with professional management. But by including gold in your investment strategy, you will cover your bases more effectively. In 2008, gold lost the least value and was one of the first things to recover. In other more “normal” corrections (i.e. crashes), gold might even go up while everything else goes down, thus balancing your overall portfolio. You should always talk to an Investment Planner who can evaluate your current portfolio and find alternative types of investments to help expand it. In the event that something catastrophic happens, you can rest easier knowing that the physical gold that you own is still there and that its intrinsic value is intact.